The port cities of Seattle and Gdynia have much in common: both are beautiful port cities, both have a rapidly growing technology center, and beautiful architectural and nature landscapes. Both cities host outstanding cultural events such as the Open’er Festival in Gdynia and Seafair in Seattle. Seattle and Gdynia formalized their friendship in a sister city agreement in 1993, one of Seattle’s twenty-one sister cities. SGSCA is a 501(c)(3) organization, staffed entirely by volunteers who are committed to sharing and promoting business, cultural and academic exchanges between the two cities. • Produced 26 Seattle Polish Film Festivals – 2018 will be our 26th Aniversary! Sister Cities International awarded Seattle-Gdynia Sister City Association with the Innovation: Youth & Education, 2010 honor for its work on Gdynia Business Week. The City of Seattle awarded Seattle-Gdynia Sister City Association with Best Overall Program, 2011 and 2006, as well as Best Single Project, 2010 for its work on Gdynia Business Week. 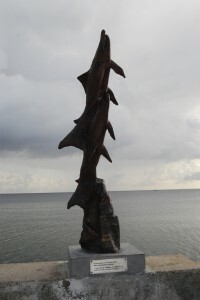 “Coming Home” – Commissioned by SGSCA and presented to the City of Gdynia. Created by local artist Louise McDowell. Keep me posted on SGSCA happenings!